Today BOJ Gov Kuroda Speaks and the US is publishing Core PPI m/m, PPI m/m, NFIB Small Business Index and Federal Budget Balance. 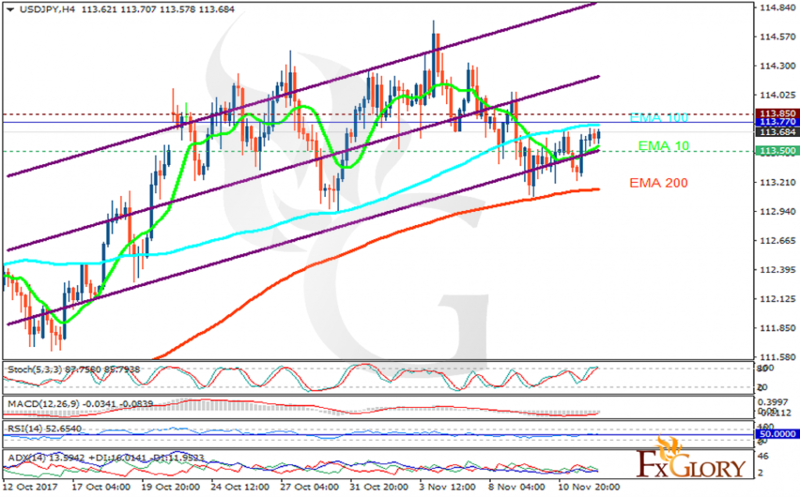 The support rests at 113.500 with resistance at 113.850 which the weekly pivot point at 113.690 is located in between the lines. The EMA of 10 is moving with bullish bias in the ascendant channel and it is below the EMA of 100 and above the EMA of 200. The RSI is moving horizontally on 50 level, the Stochastic is moving in high ranges and the MACD indicator is in negative territory. The ADX is showing buy signals. Long positions are recommended towards 114.5.